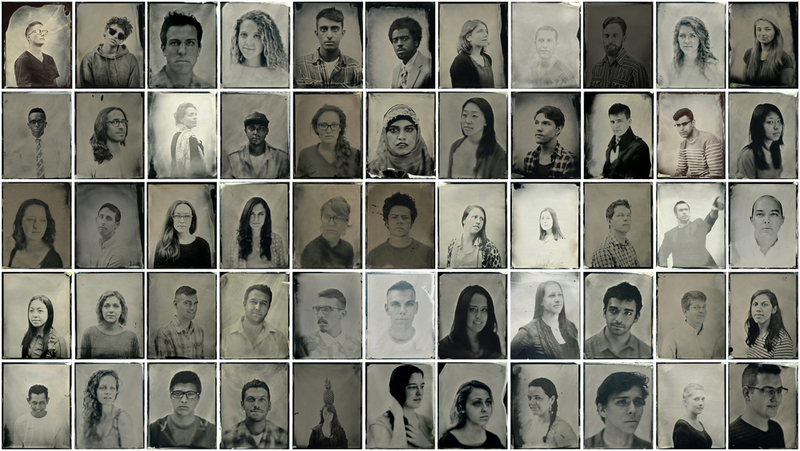 Funded by the Dean's Excellence award, “Don’t Break the Exacto Knife” is a project by Tulane School of Architecture’s, David Armentor, which attempts to capture a panorama of the Tulane School of Architecture for its 120th anniversary by creating individual formal collodion portraits of 120 students who currently occupy its space. This survey will emphasize the student community of the school, illustrating its makeup and camaraderie, while creating time capsule TSA alumni can relate to as well as reflect upon. The idea of photographing a school as well as how architecture­­ students are taught to view and use processes was very much in mind when the Wet Plate Collodion medium was chosen as the sole capture technique. My education of the process was worked out through this project. The aesthetic range of the final images show the technical learning curb and allows me to create a visual dictionary of the process’s break down. In keeping with more contemporary traditions, the QR code was added to give more of an insight to the portraits. When captured the QR code will take you to a random interest that these students enjoyed in the spring of 2014.